Harold A. Pember, 82, of Lakeview, OH, formerly of Middletown, OH, passed away Thursday, August 23, 2018 at Indian Lake Rehabilitation Center. He was born on August 17, 1936 in Fostoria, OH, a son of the late Paul and Loa Yochum Pember. He was preceded in death by a granddaughter, Madellaine Pember, a sister, Gloria Switzer, and a brother, Donald Pember. He is survived by two children: Eric (Olivia) Pember of LaVerne, CA, and Lori Mendel of Bettendorf, IA, eight grandchildren, Joshua (Amie) Pember, Gabrielle (Thomas) Warren, Bernadette Pember, Eric Joseph Pember, Starlette Pember, Luke Pember, Aaron Mendel, and Sarah Mendel, a great grandson, Jeremiah Warren, and two sisters, Donnis Bayless, and Loanna Spangler. 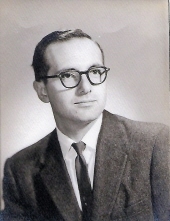 Harold graduated from Capital University and Trinity Lutheran Seminary. He was a Lutheran minister, later working as an accountant for many years and after retiring as a handyman. No public services will be observed. His remains will be laid to rest at Union Cemetery, Columbus, OH. To send flowers or a remembrance gift to the family of Harold A. Pember, please visit our Tribute Store. "Email Address" would like to share the life celebration of Harold A. Pember. Click on the "link" to go to share a favorite memory or leave a condolence message for the family.